Christianity, Cults, and the Occult, a pamphlet that can be read in 30 minutes or less, takes a close look at eleven cultic movements that have a wide range of occult connections and compares them to the origins and key beliefs of Christianity. 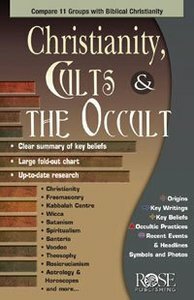 Christianity, Cults, and the Occult helps Christians understand their own beliefs, explains the backgrounds of different occults, and includes a list of occult terms and definitions, as well as Scriptural warnings against the occult. About "Christianity, Cults & the Occult"